The Sabatier Expandable Dish Rack is a classy stainless steel compact dish rack. This dish rack has very solid construction. It comes ready to use once you take it out of the box. No construction or assembly required. I found the Sabatier expandable dish rack to be very flexible to use. It can be compact to save precious countertop space. It can also be expanded to accommodate larger and additional items you wish to dry. The dish rack also features corrosion resistant technology. No more corrosion after a few months of use. The stainless steel construction also makes the item a very elegant addition to your countertop. I have already received a few compliments from friends. 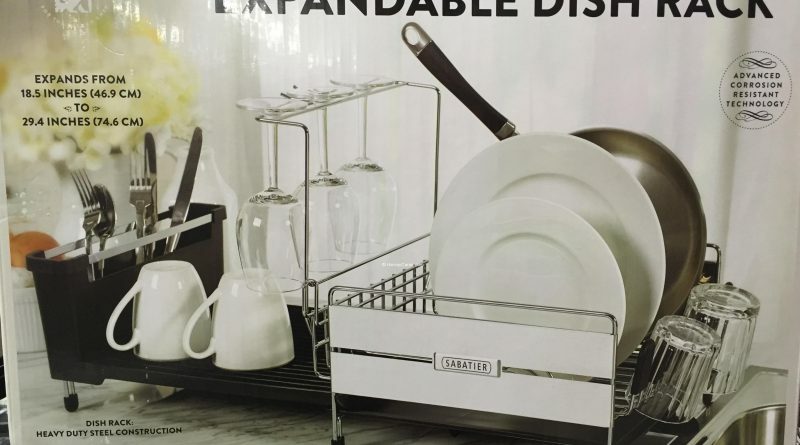 The Sabatier Expandable Dish Rack also includes a detachable stemware attachment. This will help nicely dry your wine and champagne glasses. The dish rack is supported by soft legs on the bottom. This prevents damage and scratches on your countertop. The soft legs also stabilize the dish rack when you place wet items on it. The soft legs act as a firm “grip” on your countertop and stops it from moving around. Shopping for the Best Dish Racks? 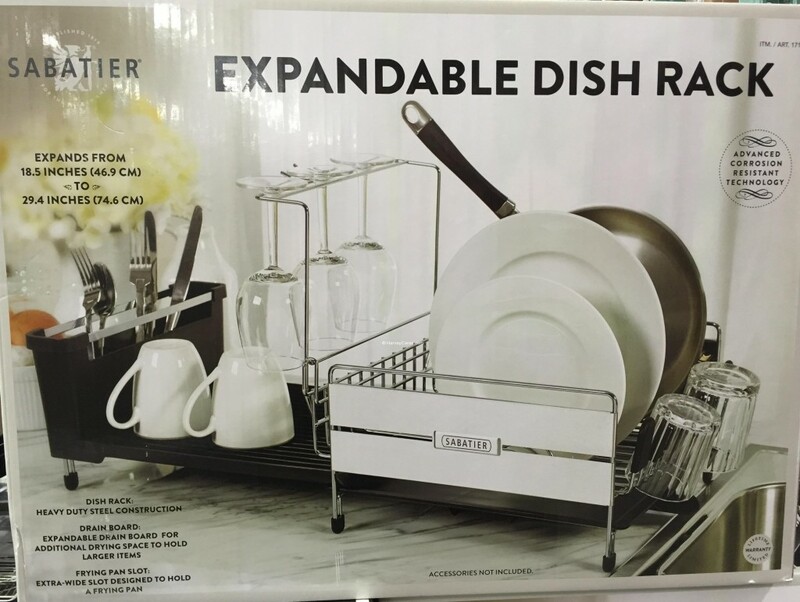 The Sabatier Expandable Dish Rack is a great item. There are also other very popular and highly rated products in this category. Back to the good stuff! Take a look at our detailed product review below. 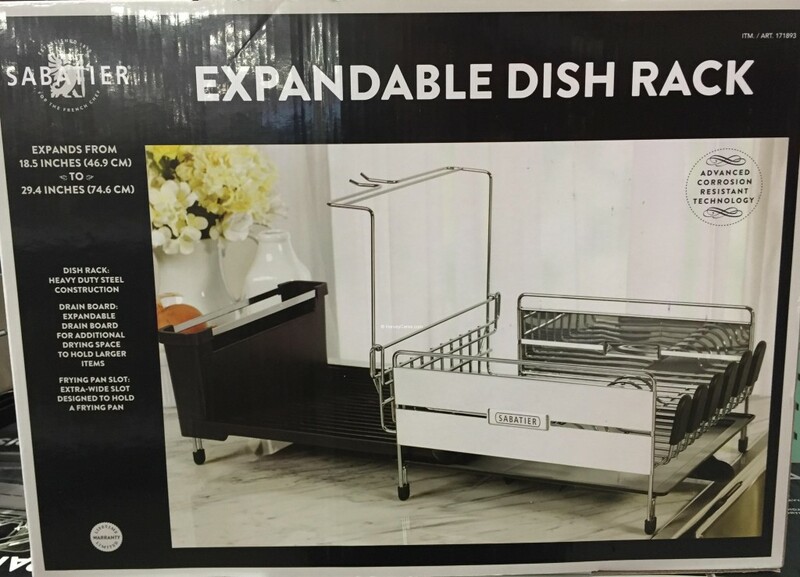 Item name: Sabatier Expandable Dish Rack. Heavy duty steel dish rack construction. 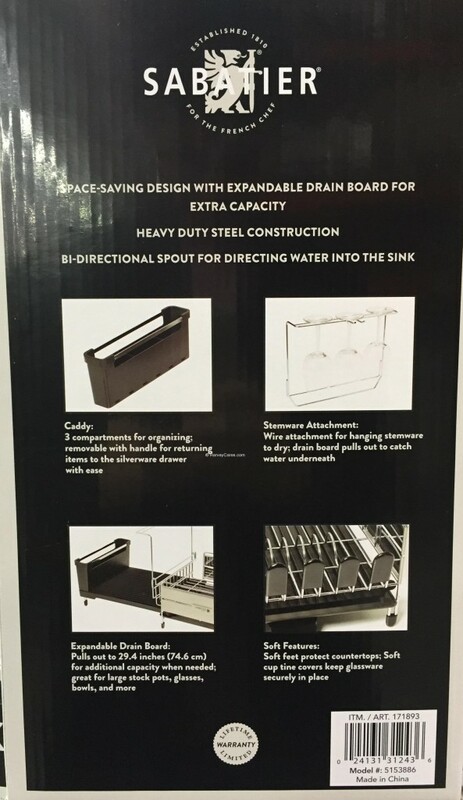 Expandable drain board to hold and dry more items. Designed to save your countertop space. Stemware attachment for holding glass. Soft feet to protect your countertop. Soft cup holders to keep items in place. Spout can be configured 2 different ways to direct water into sink. 18.5 inches (46.9 cm) when compact. 29.4 inches (74.6 cm) when expanded. Below is the unboxed view of the dish rack. You can see that it is quite compact. Thanks to Sabatier expandable dish rack’s space saving design, many dishes, pots and pans can be stacked up efficiently. Here is the Sabatier Expandable Dish Rack in its expanded mode. There is another draining board on the bottom of the stainless rack compartment not in this picture. I have found the draining system to be very well designed. I have not experienced any leaks or spills since I got the dish rack. The Sabatier Expandable Dish Rack is constructed with heavy duty steel. A bi-directional spout directs water into the sink the way you like. Designed to save precious countertop space. This is after a limited time $5 instant savings promotion. The item was available on Costco.com. However, it is not available anymore. Amazon appears to have the best price for this item with shipping included. 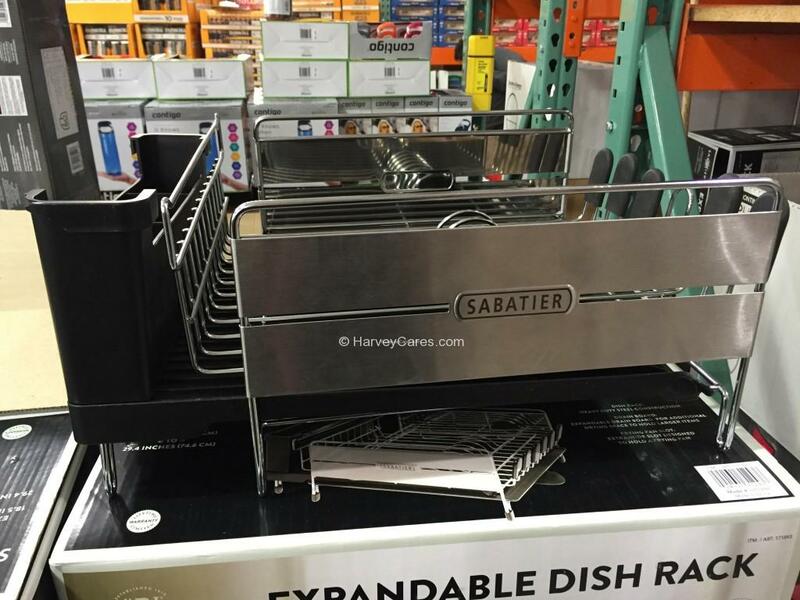 Have you bought the Sabatier Expandable Dish Rack before? 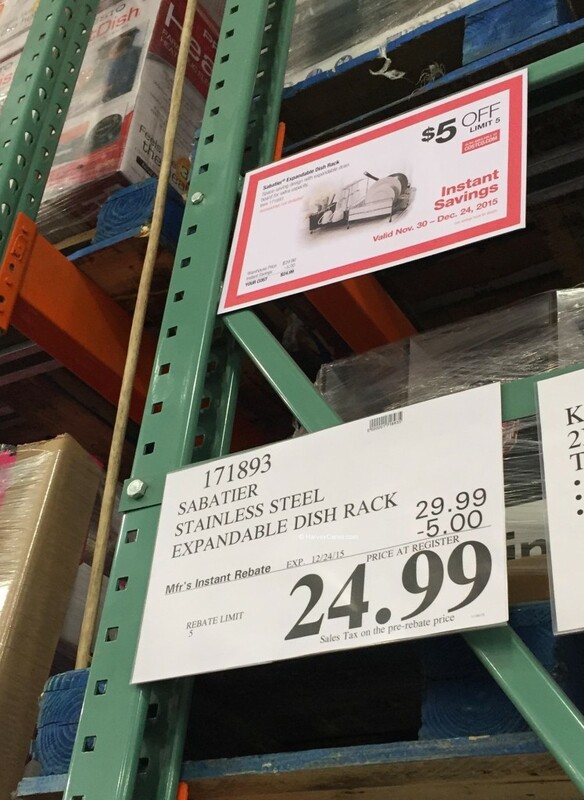 11/17/2017 – As an update, it appears that Sabatier dish racks are not available at Costco anymore. There are still some for sale on Amazon with the best prices. 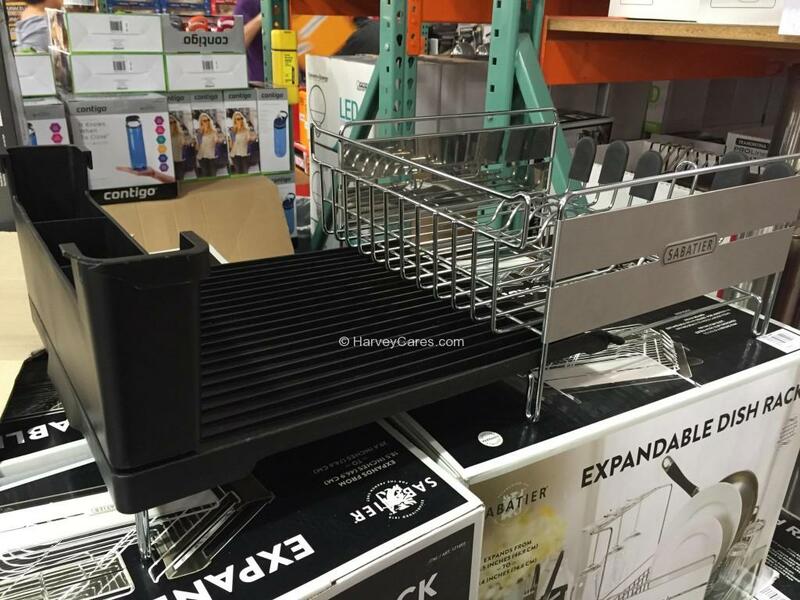 I purchased this item ( Sabatier Expandable Dishrack) from Costco in Edmonton, Alberta this past spring. At first I was very happy with it, but it has become very rusted. What do I do?! Can I return it to the store where I purchased it? Or will the company replace it for me? Sorry to hear that! My Sabatier dishrack hasn’t seen any rusting but sometimes I notice mold growing on the water collection plate (on the bottom). What I usually do is I would wash the dishrack itself with soup once a month or so, just to make sure that nothing starts growing there. This may be especially important if your kitchen is not near a window or doesn’t have fresh air circulating through it from time to time. Dishracks are often exposed to wet elements for long periods of time and it’s inevitable that some things grow on it. Cleaning it periodically should help extend its life. The easiest way – I would return it to the store where you purchased the dish rack from and inform them that rust has developed.